An image supposedly showing the upcoming Galaxy S4 Zoom camera phone has hit the web revealing a rather strange device than one would have expected. This creation bears some similarity to the recently announced Galaxy S4 Mini but also to last year’s Galaxy Camera. At this point, it’s not clear whether the image is accurate, but we’ll probably find out more details in the near future, considering that the Galaxy S4 Zoom product name has indirectly been confirmed already. The Galaxy S4 Zoom is expected to have smartphone features similar to the Galaxy S4 Mini’s, but camera features similar to the Galaxy Camera’s. In what follows, you’ll see the press images of these products, in order to compare them yourself with this leaked image. What we’ll immediately notice is that the smartphone side of the device is not entirely similar to the Galayx S4 Mini. The sensors are apparently placed on the other side of that speaker grille, and the volume keys have been moved to the right side of the handset. 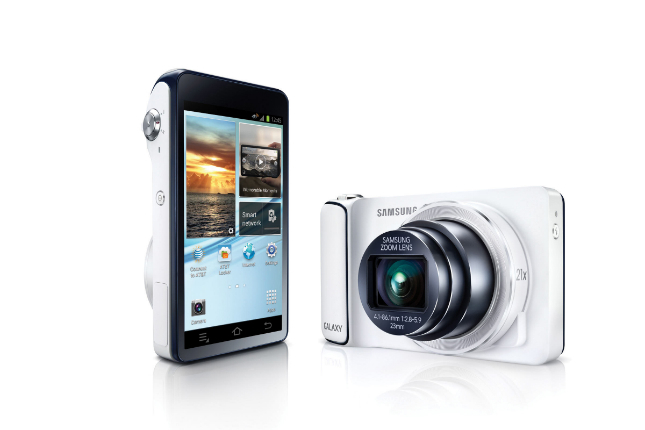 Also on the right, there seems to be a dedicated camera shutter button, which is similar to the Galaxy Camera’s button. A rather big camera lens is placed on the back of the device, but an image showing it in its entirety is not available. The Galaxy S4 Zoom seems to be about as bulky as the Galaxy Camera, and it’s definitely not the slender device you may have expected. A few days ago we wondered whether the Galaxy S4 Zoom will be the successor of the Galaxy Camera, or a standalone product. Today’s reports seem to indicate that the Galaxy Camera will get its own successor, with the Galaxy S4 Zoom being the last member of the Galaxy S4 family. Sam Mobile says it received the image on Wednesday June 5, which appears to be the date on the screen of the handset in the leaked image. That doesn’t mean the image is legit, so hold on to that grain of salt. We do expect to see this device come out soon, maybe at Samsung’s June 20 event in London, where other new Galaxy S4 members like the Mini and the Active will also appear. That said, we’ll also list the unconfirmed specs and features for the Galaxy S4 Zoom, while we wait for the product to become official. The camera phone is said to pack a 4.3-inch qHD Super AMOLED display, 1.6GHz dual-core processor, 16-megapixel camera with optical zoom, 8GB of internal storage, microSD support for up to 64GB, Bluetooth 4.0, Wi-Fi a/b/g/n, AGPS and Android 4.2.2 Jelly Bean. What do you think about the image?